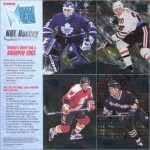 This is a nine-card uncut sheet of cards, given to retailers to promote the 1991-92 Topps and Bowman hockey card sets. 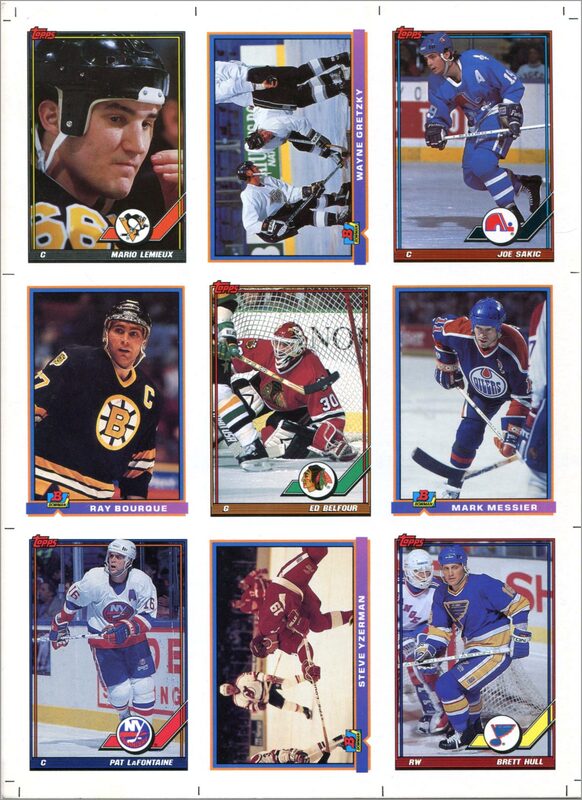 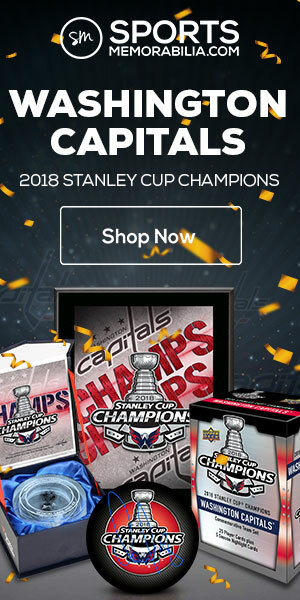 As you can see, it features nine of the greatest hockey players from the 1990s: Mario Lemieux, Wayne Gretzky, Joe Sakic, Ray Bourque, Ed Belfour, Mark Messier, Pat Lafontaine, Steve Yzerman and Brett Hull. 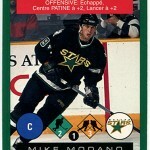 If you collect cards of any of these players, this is a very cool item to have in your collection. 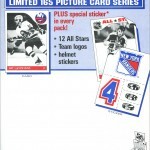 Most of the photos used on the pre-production samples vary in some way from the actual cards that were released in packs. 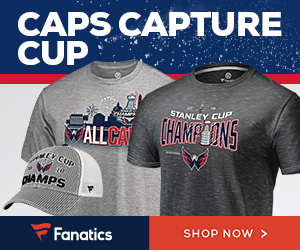 Here is a rundown of those differences. 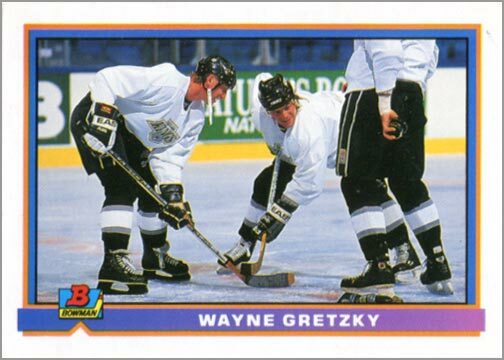 Wayne Gretzky: The prototype card (top) cuts off Gretzky’s skate and stick, while the real card (bottom) crops the photo differently. 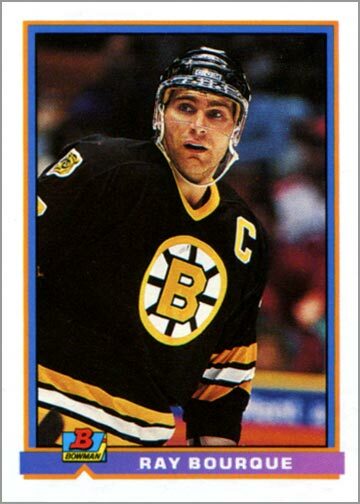 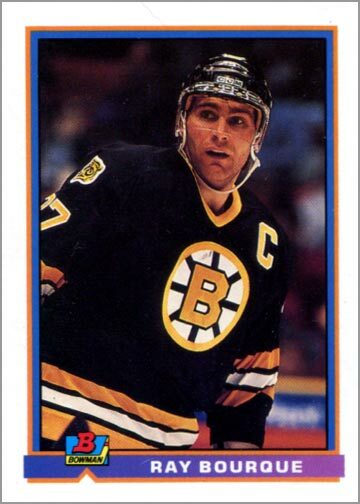 Ray Bourque: The prototype card of Bourque (top) shows more at the left, while the real card (bottom) cuts off most of Bourque’s sleeve number and centers his head in the frame. 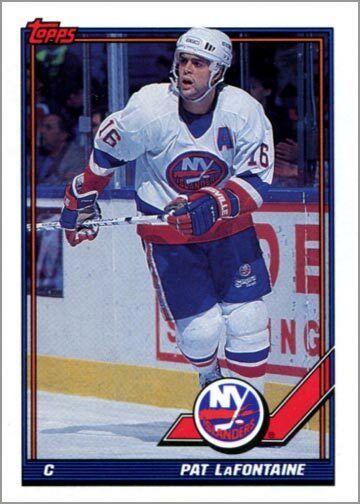 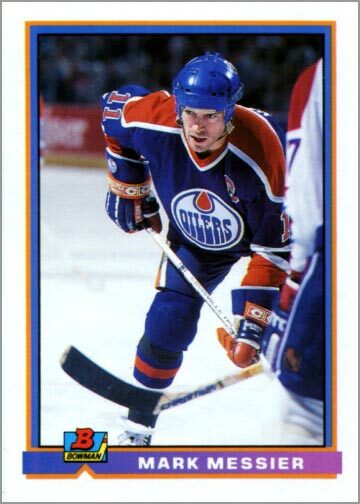 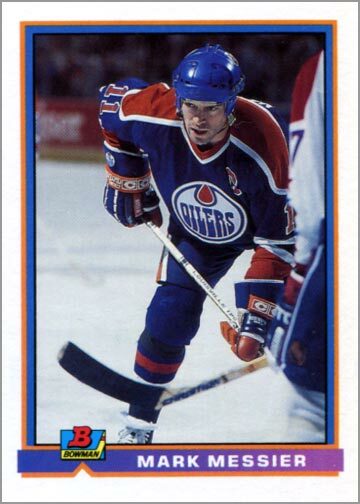 Mark Messier: The photo used was adjusted slightly, with Messier being closer to the top border on the prototype card (top), and a bit further away from the top border on the real card (bottom). 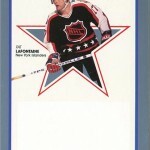 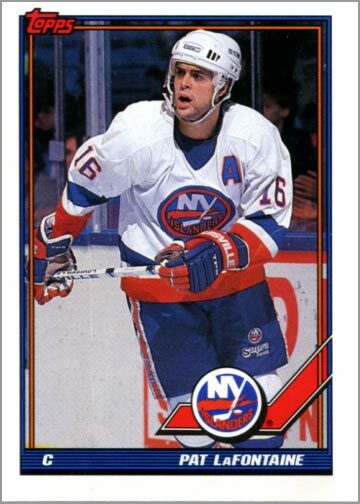 Pat Lafontaine: The prototype card (top) is “zoomed out,” while the actual card (bottom) is more “zoomed in.” Lafontaine’s head is also moved down so that he does not overlap the border. 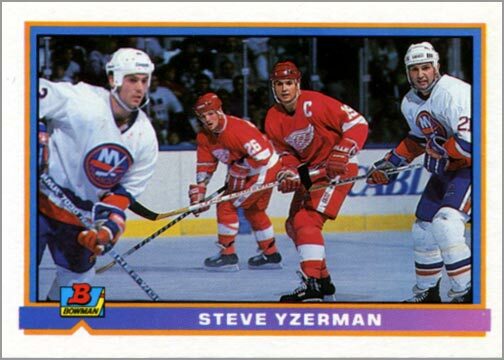 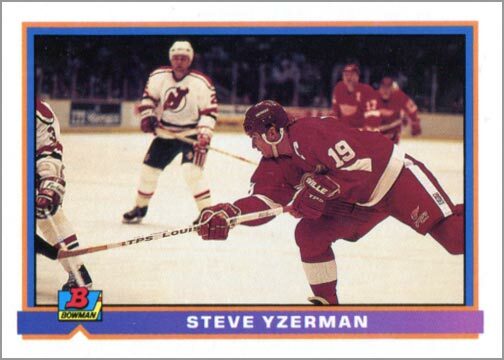 Steve Yzerman: The prototype card (top) uses an entirely different photo than the Bowman card of Yzerman that was issued in wax packs. 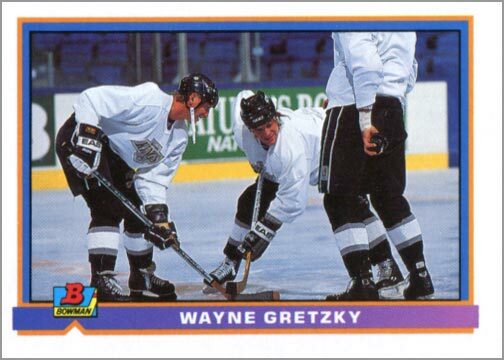 The photo on the prototype card is more dynamic, yet awkwardly framed. 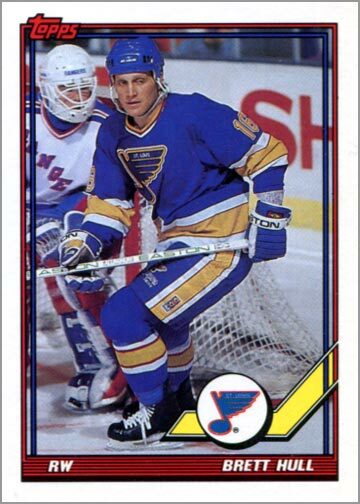 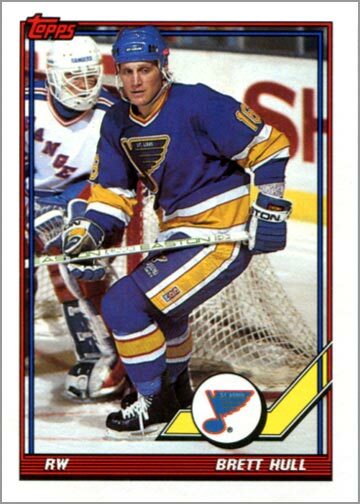 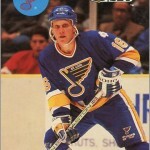 Brett Hull: The photo used is adjusted slightly, with Hull’s helmet overlapping the border on the real card (bottom). 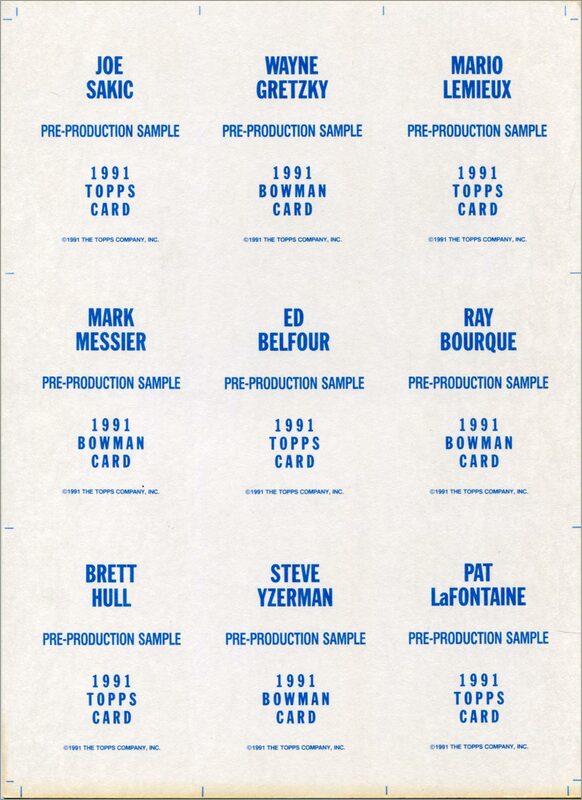 Sure, both the 1991-92 Topps and 1991-92 Bowman Hockey sets were forgettable, but this prototype sheet is worth remembering because of all the great players it has.